Synthetic peptide corresponding to C terminal residues of human alpha 2 Macroglobulin. Our Abpromise guarantee covers the use of ab58703 in the following tested applications. IHC-P: Use at a concentration of 2 µg/ml. WB: Use at an assay dependent concentration. Predicted molecular weight: 163 kDa. Belongs to the protease inhibitor I39 (alpha-2-macroglobulin) family. Contrary to the rat protein, which is an acute phase protein, this protein is always present at high levels in circulation. Western blot - Anti-alpha 2 Macroglobulin antibody (ab58703)Image from Jain MR et al, Proteome Sci. 2009 Jul 16;7:25, Fig 2. Three independent control and encephalomyelitis samples were used for Western blotting analysis. Samples were first resolved on a 12.5% SDS-PAGE gel and then transferred to a nitrocellulose membrane. The membrane was rinsed with PBS and the non specific binding sites were blocked in a solution of 5% non-fat milk in PBST (0.05% Tween 20 in PBS) for 1 hour at room temperature, followed by three washes in PBST for 10 minutes each. The membrane was first incubated with ab58703 at a 1/1,000 dilution overnight and then washed in PBST buffer as described above. 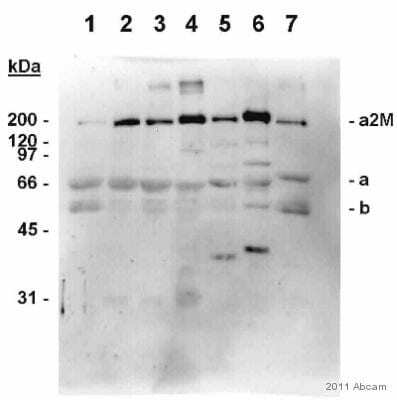 The immunocomplexes were visualized by Western Lightning® Western Blot Chemiluminescence Reagent Plus, using a goat anti-rabbit IgG coupled to horseradish peroxidase as the secondary antibody. Ab58703 staining alpha 2 Macroglobulin in human liver. ab58703 staining alpha 2 Macroglobulin in rat decidual cells by Immunocytochemistry. Cells were fixed with Methanol, permeabilized with PBS, 5% BSA, 0.1% Triton X-100 and 0.2% Tween-20 and blocking with 5% BSA was performed for 15 minutes at RT. Samples were incubated with primary antibody (1/500) in PBS for 14 hours at 4°C. A commercially available Avidin–biotin alkaline phosphatase complex technique was used. Publishing research using ab58703? Please let us know so that we can cite the reference in this datasheet. I would like to edit some of my previously submitted abreviews. We performed new western blots on the antibodies and would like to edit the reviews with the new data and images. The antibodies are: -Anti-Ceruloplasmin antibody (ab8813) -Anti-Carbonic Anhydrase I antibody (ab6619) -Anti-alpha 2 Macroglobulin antibody (ab58703) Please let me know if this is possible. Thank you. Editing your own review shouldn't be a problem: Just log into your account again and upload the images. Please let me know if you come across any problems.